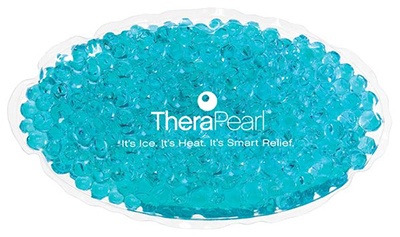 Designed by a doctor, TheraPearl provides both hot and cold therapy. Their body-hugging shapes don't leak or drip during use. Independent lab results prove that TheraPearl products are non-toxic, so there's not threat of VOCs, heavy metals or BPA. Freeze or microwave. After use, TheraPearl Packs can be cleaned with a mild soap, detergent or alcohol. The Oval Contour Pack is the ideal shape and size for hands, shoulders and breasts. For COLD therapy - Place your TheraPearl Eye Pack flat in freezer for at least 2 hours. Adjust to comfort by placing a thin clean cloth or paper towel between the TheraPearl Pack and the skin if necessary. It is recommended to apply TheraPearl for 20 minutes (or as directed by your doctor), and then off the affected area for 40-45 minutes (or as directed by your doctor). For better results, return TheraPearl to the freezer after every use. The cold Pack can be reapplied after being cooled again. When stored in the freezer, do not place any heavy objects on top of your Pack. For HEAT therapy - Wrap your TheraPearl Pack with a damp cloth or paper towel. Microwave for 15 seconds. Since microwaves vary in power, you may microwave your Pack for additional 5 second intervals until desired temperature is reached. Adjust to comfort by placing a thin clean cloth or paper towel between the TheraPearl Pack and the skin if necessary. It is recommended to apply TheraPearl for 20 minutes (or as directed by your doctor), and then off the affected area for 40-45 minutes (or as directed by your doctor). TheraPearl Packs can be reapplied after being warmed again.